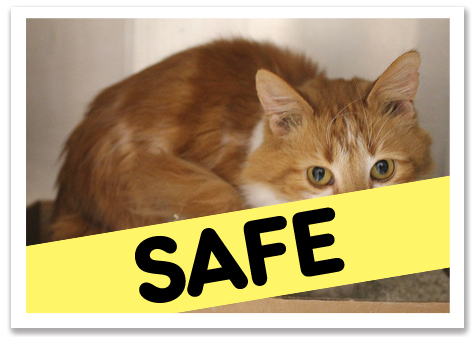 I just heard from Lisa, our friend at SPCA of Wake County in Raleigh, NC. She gave me an update on the 9 cats (an additional 3 cats went to another rescue) they rescued from Iredell Animals Services last week. If you recall, these cats were subjected to being caged for 2 YEARS due to an animal cruelty investigation and subsequent court case. 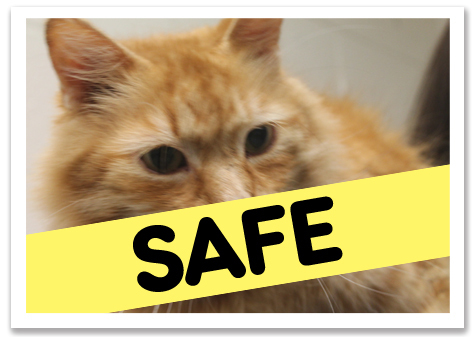 Once the cats were free to go, they still faced being euthanized because many have minor health issues and some are senior-aged. 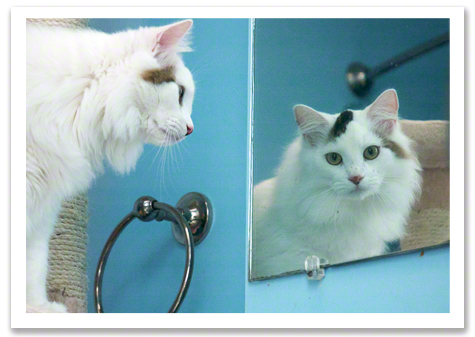 ©2013 SPCA Wake County. Tabitha enjoying life out of a cage. 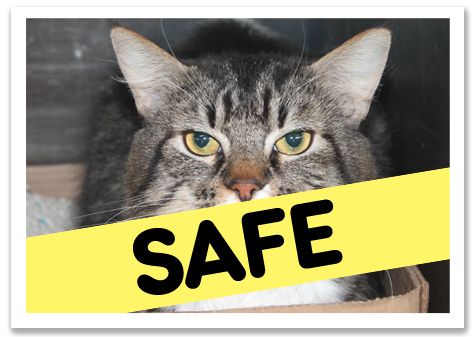 SPCA Wake County didn't balk at taking on these cats. They didn't pick out the prettiest ones or easiest to adopt-they TOOK THEM ALL and my hat is off to them for their good deed. ©2013 SPCA Wake County. Brian, still a bit scared, but slowly coming out of his shell. 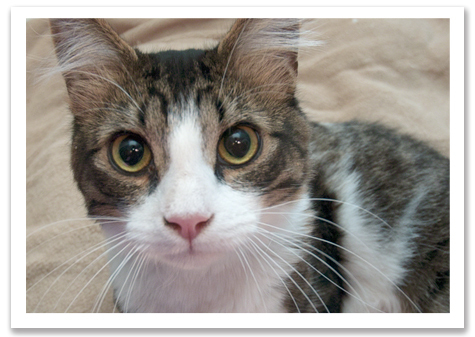 “Benson, Brian, Cougar and Tabitha are the first ones available for adoption. You can see their photos and listings at www.spcawake.org/adopt by clicking on the "view cats available for adoption" icon and scrolling through the alphabetical list. 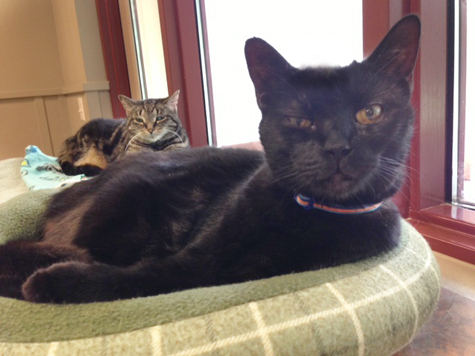 Attached is a photo of Tabitha and Cougar lounging in one of our communal cat rooms. Leroy, Max and Jethro all turned out to be intact. They will be neutered tomorrow and available for adoption starting on Friday. ©2013 SPCA Wake County. Cougar, tail up, happy again! Tori had a cyst on her chin and we're waiting for lab results before we put her up for adoption. Red Boy is a real trooper. Of his ten front claws, seven of them were grown into his paw pads. Ouch! It was quite extreme to say the least. He had surgery yesterday and after one more week of cage rest and an e-collar he should be cleared for adoption. ©2013 SPCA Wake County. Tabitha (back) and Cougra (front) relax in their comfortable new shelter. All they need is to be adopted! These cats have waited a long time. Our last act should be to make sure they all find good homes. If you'd like to adopt any of these kitties, please call or visit SPCA of Wake County. Twelve cats I reported about a week ago who were caged for TWO YEARS at Iredell Animal Services due to a legal dispute, had their dream come true today. EVERY SINGLE CAT HAS A RESCUE. 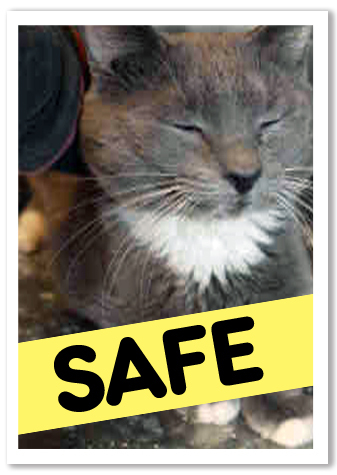 ALL OF THE CATS ARE SAFE AND SOUND. NONE OF THEM WERE EUTHANIZED! 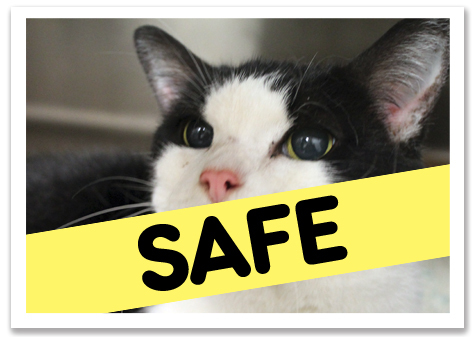 A HUGE, THANK YOU TO the SPCA OF WAKE COUNTY for being so receptive to my email asking for help that they got to work putting together the necessary planning to take on NINE of the TWELVE CATS (the others were taken by another rescue). 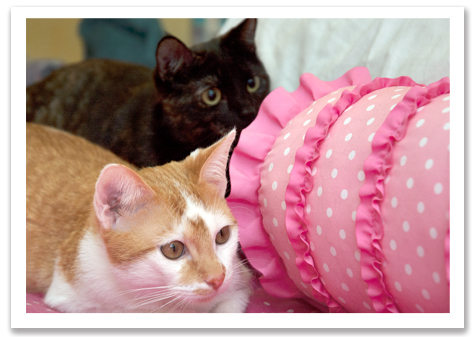 Please visit their FACEBOOK PAGE and tell them THANK YOU from Covered in Cat Hair and LIKE THEIR PAGE! If you feel so inclined MAKE A DONATION in honor of these cats so that SPCA of Wake County can continue to help cats like these in the future. SPCA of WAKE COUNTY-YOU ROCK. You took on all the cats. You didn't “cherry pick” out the “good” ones. You're helping them all. 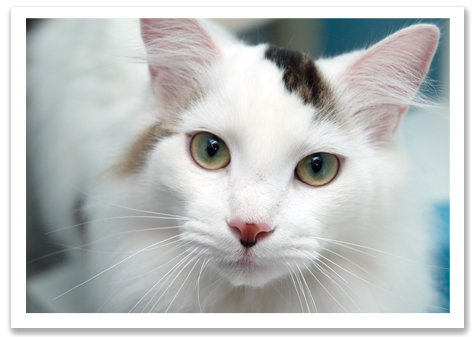 IF YOU LIVE IN OR NEAR RALEIGH, NORTH CAROLINA, stop by SPCA of Wake County and ADOPT ONE OF THESE KITTIES! They've had a Hell of a long ride and deserve loving homes. If you know of anyone looking to adopt, send them to SPCA of Wake County! 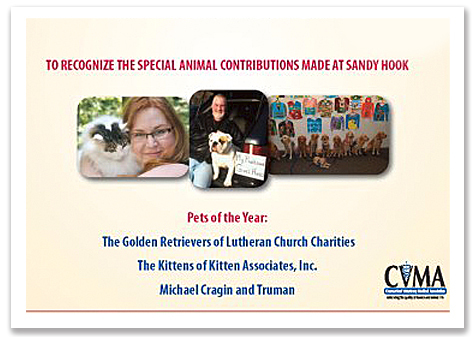 It's a happy day for these deserving cats. 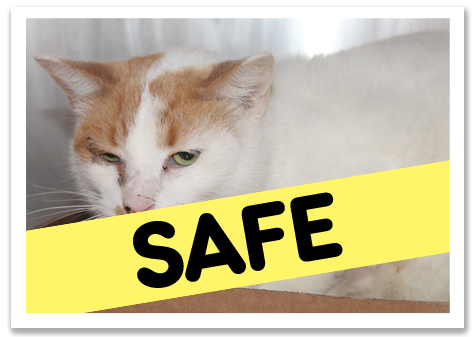 Brian is aNeutered male, short haired white/orange tabby. He's a LARGE cat. Good appetite! 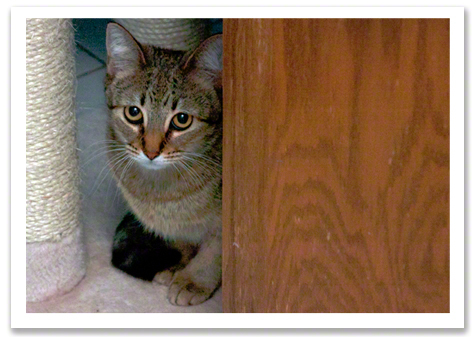 Brian is good with other cats, but is a little shy. Not aggressive at all with cats or people, just nervous. Would probably come out of his "shell" once in a calm and quiet home. Does have eye and nose drainage. Has upper resp. issues. Poor Brian! He sits in his cat litter pan because the scent of it is his only comfort. Brain looks depressed or angry, but he's a nice kitty. He's emotionally exhausted from the stress of living in a cage for so long. Can you love this big lug? 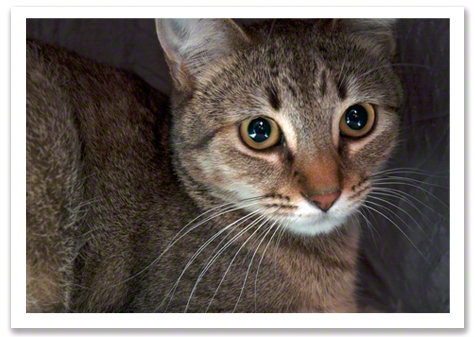 Cougar is a short haired female (underbelly indicates possibly spayed). Good temperament. Possible slight upper resp. symptoms. 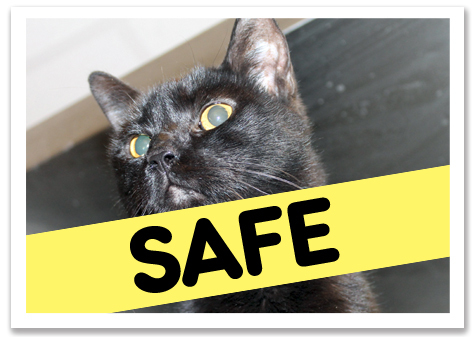 Rarely do black cats have a happy ending once their in a shelter. Cougar is a nice cat who just needs a break. Intact male, 3-5 years of age. 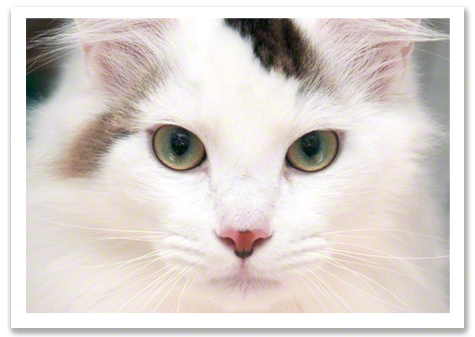 Medium haired Tabby/White. Temperament was very good, but in last few months has been slightly temperamental (they believe once out of "caged" environment temperament will once again improve). Possible slight upper resp. issues, but overall seems healthy! Look at that FACE! Jethro is asking you to bust him out of that cage. 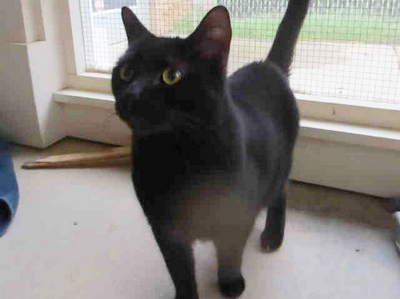 He's so handsome and friendly, I'm sure he would make a great addition to any home. Intact male, short haired gray/white. Very friendly. Seems ok with other cats. 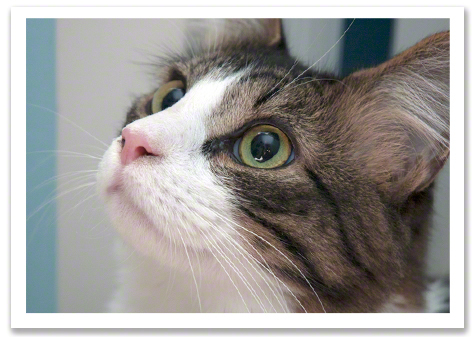 Cat is slim, but not too underweight. Cat has good appetite. Slight upper resp. issues. Owner had as 10 years of age, would not guess that old in age. What do you think? I think Max wants to play and have fun! What pretty eyes, too! 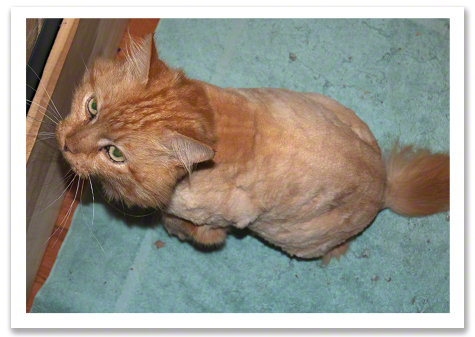 Medium haired, neutered male orange tabby. Approx 7 years old. 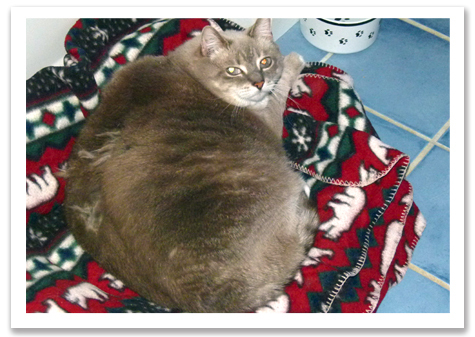 Cat is overweight and has a great appetite! Very friendly with other cats and with people. Have not noticed any eye or nose discharge, but still possible to have slight upper respiratory issues. Teeth are yellowing and are "worn". Red Boy is an older kitty. 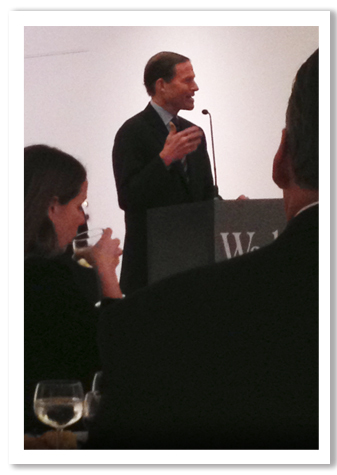 Those of you who know this blog well, will notice that he looks too much like my guy, Bob Dole. Red Boy is too adorable to stay in a cage any longer. 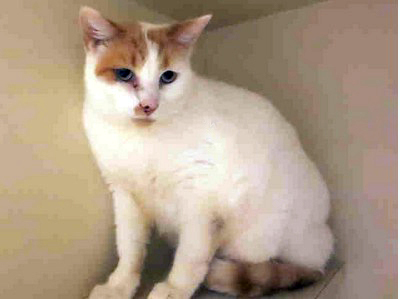 Neutered/Male, Medium haired Orange Tabby/White. Approx 5 years old. Cat is friendly, but VERY nervous. Not aggressive. I believe once out of a "caged" environment will be an independent calm and happy cat. Weight is good. Possible slight upper resp. issues. Sammy looks so scared, but what a knockout! He's another cat who will blossom once he's safely out of the shelter. I don't have to convince anyone that Suzie needs to be rescued. Look at her! Short haired, black/white cat. Has some dental issues. Very friendly and seems ok with other cats. Good body weight, but poor hair coat (dull coat). Has slight upper respiratory issues. Sweet Tori. It's easy to overlook a cat who might have some minor health issues, but none of them are her fault. 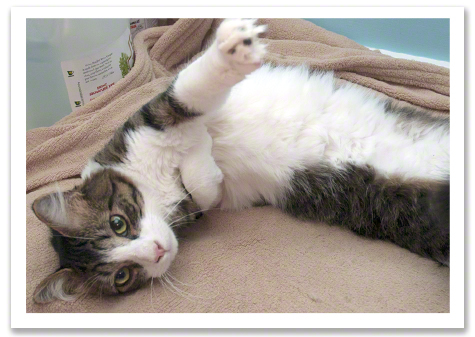 With good food and some vet care, this kitty could be your best friend. 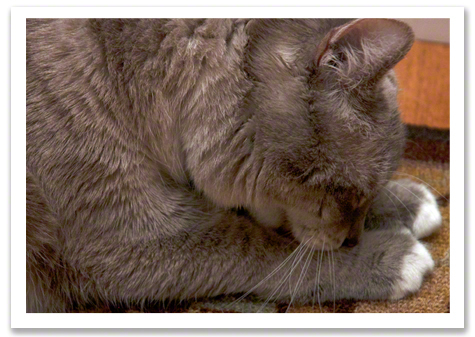 Short haired, gray/white cat. Slightly underweight. Very friendly. Has started to defecate outside of litter box in past couple months. I believe once out of a "caged" environment cat will return to using litter box. Fur is dull. This photo arrived distorted so I tried to fix it. Working on getting a replacement image. Journey is a senior-about 12 years old. She's a short haired, black/white cat. Cat has no teeth and has been on canned food only. Cat has upper respiratory issues. Cat appears to be losing weight and appears to have stopped grooming regularly. Poor fur coat. Cat is friendly and seems ok with other cats, but is "high energy". Possibly spayed. This is the initial notes from the shelter. I personally had this cat for a week in my office. She was beyond kennel stressed, and just letting her out in my office to stretch was the best thing for her. She is absolutely hilarious! In the mornings she would greet me at the door, and proceed to stand on my desk in front of my computer screen and paw at me until we had our morning “hellos”. She would only then go and lay in her bed. Wonderfully loving and sweet cat! She's a SENIOR and a wreck. Of all the cats this one cuts me the deepest. I hope we can find a way to get her OUT. I know she can recover from her difficult time in a cage, but we need help to make it happen. 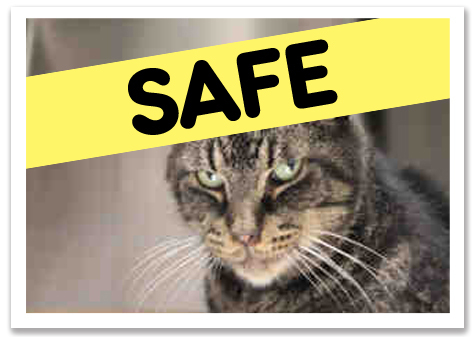 Benson is an approximately 5 year old, neutered male tabby cat. He has URI issues with an unknown cause despite treatment. [Note from Robin: He may have bartonella which is an easy test to do and 3 week course of antibiotics-not a big deal if that's the case. Just being out of this environment may be all he needs to get better. Cats get SICK if they get STRESSED.] 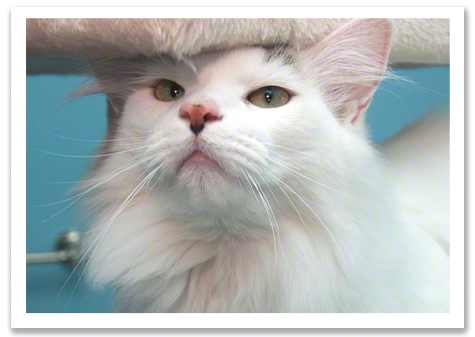 He is friendly to humans and is good around other cats. His left ear slouches, and we suspect that is from an old hematoma. This guy is a big, friendly dude. Sure he's a bit rough around the edges, but with a little polishing he'll be a treasure. He just wants to make friends and love his family. 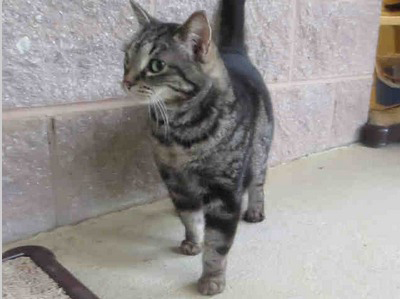 She's a sweet tabby who has not only suffered confinement, but illness. She CAN get better and it may take as little as getting out OUT of the shelter and into a loving home. Please don't overlook this little sweetie. 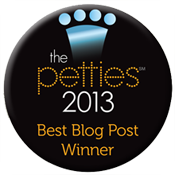 Dee reads my blog (Thank you, Dee!). She bugged her friend, Angi to give Chloe a foster home since Angi lives in Connecticut, has cats and LOVES cats enough to take on one more (and she's also an awesome artist). Dee already fosters cats and knows that Angi would do a great job so she used whatever secret powers she has to urge Angi to give Chloe a home until she's ready to go to her forever home. ©2013 Robin A.F. Olson. Poor Chloe. Feeling scared was not a surprise, but what happened next certainly was. I would call this “finding a foster home in a haystack,” because I thought there is NO WAY we're going to be able to find a LONG-TERM foster home for Chloe. Color me surprised. ©2013 Robin A.F. Olson. A little self-soothing foot bath before she explores the room any further. Angi is awesome. She's vivacious and cute with a funky-cool haircut and an easy going attitude. I did a home visit to make sure she had a good space for Chloe to pass the next few months, recover from her abuse and to lose a bit of weight (she's already lost a pound). Angi had a perfect space-a guest room in the corner of her home that overlooks her yard. It's a far cry from the bathroom where Chloe has been staying with Katherine and it's almost as big as the entire living room where Chloe once lived with her former guardian. ©2013 Robin A.F. Olson. 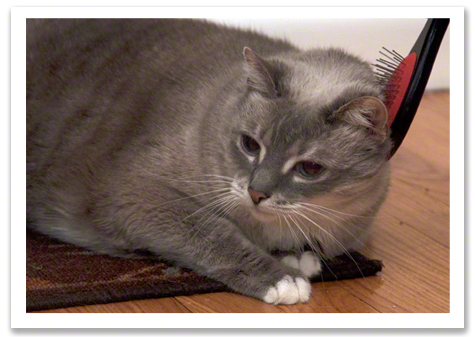 Katherine brings out Chloe's favorite brush. Everything went well with the home visit and today Katherine and I delivered Chloe to Angi's home. Chloe didn't protest too much in the car, but Katherine and I both worried what she'd do when she got out of her cat carrier. Would she completely revert to being aggressive with Angi? Would she try to bite her? Would she growl and lash out? ©2013 Robin A.F. Olson. 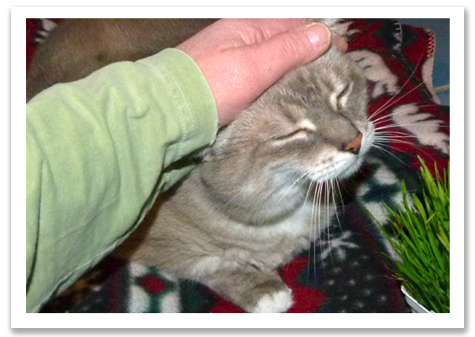 Chloe's FAVORITE-Cat Grass! We covered her cat carrier and rushed her into Angi's house, before Angi's three cats knew what we were up to. We got the room set up with Chloe's things while Chloe watched us from the safety of her crate. Then came the big moment-opening the door. We all took a collective deep breath as Katherine opened the crate. 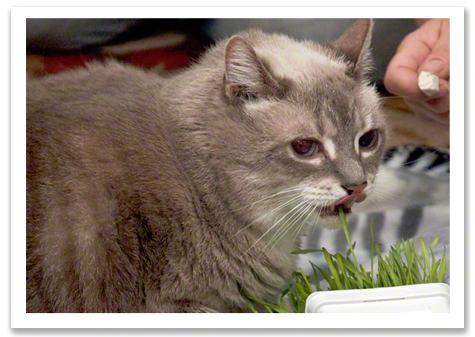 Out walked Chloe, planting her face directly into a small container of cat grass. Content to munch on her favorite treat, we all relaxed. At least Chloe wasn't going to charge us, guns blazing. ©2013 Robin A.F. Olson. 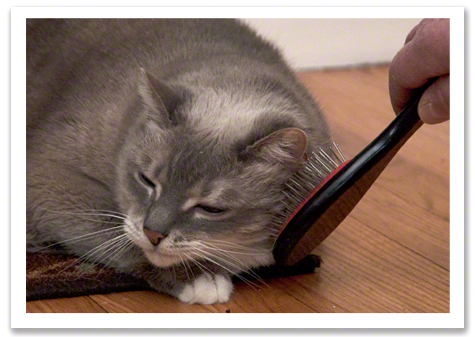 Or is Chloe's favorite thing being brushed? 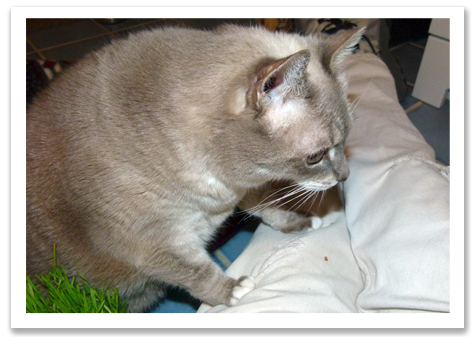 Chloe, energized from her treat, surprised us by getting up and casually began to examine her new home. She rubbed her face onto Angi's outstretched hand, the table, the edge of the cat carrier. She rubbed up against ME, which at first scared, then delighted me, leaving me sitting there with my mouth hanging open like an idiot. Chloe continued exploring the room. She didn't go very fast or very far. She had to take a break and sit down every so often, but she wasn't hiding. She was simply curious. So far, so good. ©2013 Robin A.F. Olson. Happy Buddha-kitty! 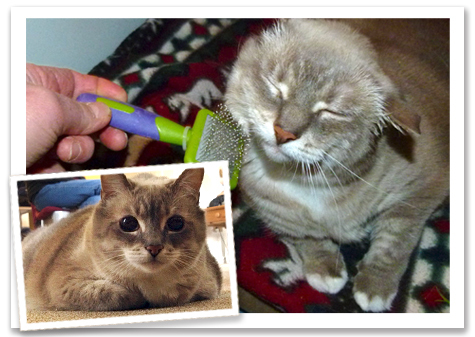 Katherine got Chloe's favorite brush out and that put a smile onto this kitty's face. 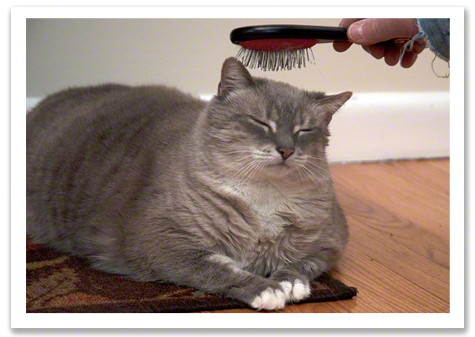 Chloe loved being brushed and it helped her relax. Hopefully she could trust that even in this new place, with the new smells, things would go on as they did before. She'd still get loved and cared for. It was going to be okay, right? ©2013 Robin A.F. Olson. Reaching up to be brushed. More, please! Chloe got a bit irritated from all the attention. Perhaps it was a bit too much, too soon. She gave Katherine and Angi a “love bite,” but nothing worse. Katherine stopped brushing Chloe and decided it was time to go over the instructions for taking care of her with Angi. Everything went surprisingly well. Since Chloe was settled, we bid Angi goodbye and good luck. I joked that Angi should invest in a pair of rattlesnake boots to protect her legs when she entered Chloe's room. I hoped I was wrong, but in a situation like this-and with Chloe losing Katherine, who knows what would happen next? Katherine and I left Angi's, feeling happy and hopeful that Chloe would finally have a chance to flower. ©2013 Robin A.F. Olson. A little love from Katherine. A few hours later, Angi wrote that she was have a bit of hard time getting BACK into the room with Chloe and that Chloe attacked her ankles. I guess I shouldn't have made a joke about the boots, but then I realized maybe someone had kicked Chloe and that's why she was upset? When we let her out of the cat carrier, we were all sitting on the floor, which made us less intimidating. Now what was Angi going to do? ©2013 Robin A.F. Olson. A few skritches from Aunt Angi. Angi took it in stride. She knows this is going to be a long process and now Chloe will have to learn to trust her, too. She's prepared to give Chloe every chance, if Chloe will just allow her into the room once in awhile so she can water her plants. When I first met Chloe and assessed her for rescue, I had serious concerns that her behavior would change any time soon-that I'd be putting my friend, Katherine into a tough situation because ultimately Katherine would be responsible for this cat's future. I was clear with Katherine that right now Chloe was not adoptable, but I had a glimmer of faith that this cat COULD turn around. We just didn't know if it would take months or years to do so. In cat rescue it's rare to have the luxury of time when there are so many other cats who are just as deserving and who also need help. It's a constant dilemma. The good thing about smaller rescues is that sometimes they can take that time. They aren't faced with the crushing demand big shelters get for space-not that they aren't always busy, but it's not as severe. Even here I've been able to hold cats for over a year when necessary. Is it the best thing to do? No. For those cats, I'd guess they'd beg to differ. ©2013 Katherine Reid. Chloe knows there's a treat on Katherine's leg, but will she try to reach it? Chloe has made some astounding changes, almost overnight. Katherine has worked tirelessly to offer Chloe everything she can think of to enrich Chloe's life and give Chloe a good reason to bond with Katherine. 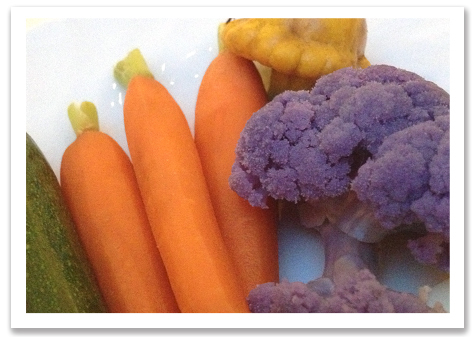 Katherine tried all sorts of grain-free treats, different types of canned and dry food. 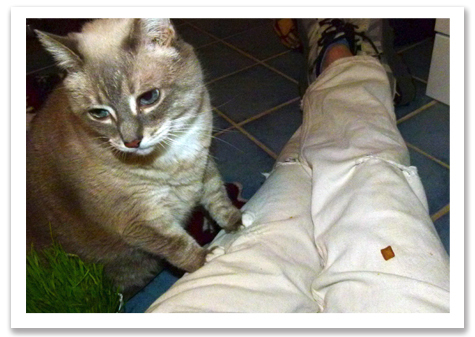 Two days ago Katherine brought Chloe an offering of cat grass-something none of us had thought to try. Within moments Chloe was greedily chomping the grass. She was having SO MUCH FUN that Katherine was able to brush away Chloe's matted fur. Chloe was too happy to care about being brushed and the mats came out easily. ©2013 Katherine Reid. Treat gone! Cat on lap-almost! Katherine persisted, always giving Chloe space and passed only short periods of time in the room with her. Chloe quickly realized that Katherine had the GOOD treats, that Katherine wasn't going to harm her; and with that Katherine was rewarded by having her FIRST CONTACT with Chloe that didn't result in bloodshed. ©2013 Katherine Reid. First pets-no growling or hissing, too! Once Katherine began to pet Chloe, a new cat shyly emerged, one who may have been beaten down, or simply ignored for so long that she gave up, we'll never really know. What we do know is that Chloe is blossoming, instead of retreating. 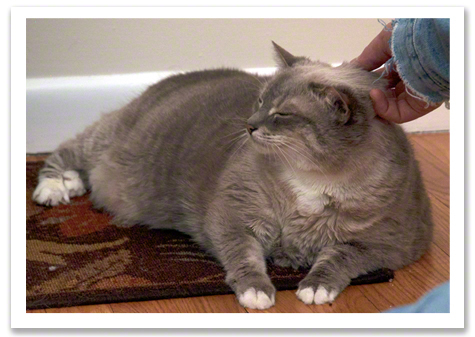 This cat has the heart of a warrior, this chubby siamese mix, and so does her foster mom. Katherine has an extremely full plate. She could have opted to put Chloe in her shelter and let her sort it out while she went back focusing on her other duties. 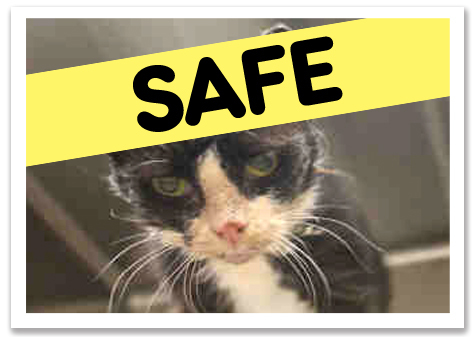 She could have taken Chloe at face value two weeks ago and opted to euthanize her because it would have taken too much time to turn her around-and there was NO GUARANTEE that it would EVER HAPPEN anyway. Luckily for Chloe, Katherine was willing to give her a chance. ©2013 Katherine Reid. Katherine tried a number of different brush types on Chloe until she reacted positively. Look a the HUGE change in Chloe's expression. Katherine and I are cut from the same cloth. We NEVER want to give up on ANY CAT and Chloe was no different. We couldn't know she would begin to trust again, but when I saw that glimmer of joy the moment I met her, fleeting though it was, I had a feeling we needed to try and I'm so grateful that Katherine agreed. Chloe still has a long road ahead of her, but now that her mats are brushed away and her ears have finally been medicated, each day Chloe will feel more comfortable and confident. I believe it's safe to say (KNOCK WOOD) that Chloe's darkest hours are passed and, with any luck, a bright shimmering future lies ahead. ©2013 Katherine Reid. 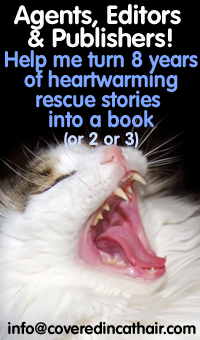 This is the moment all rescuers live for. Thank you to Katherine for sharing it with all of us. 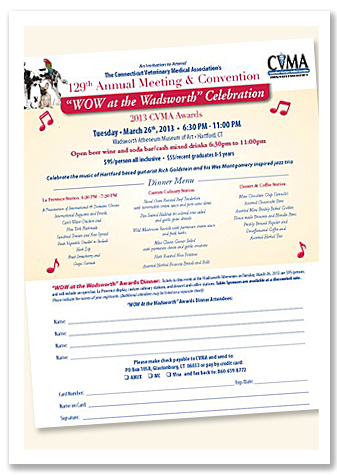 Animals in Distress is a 501(c)3 non-profit organization. 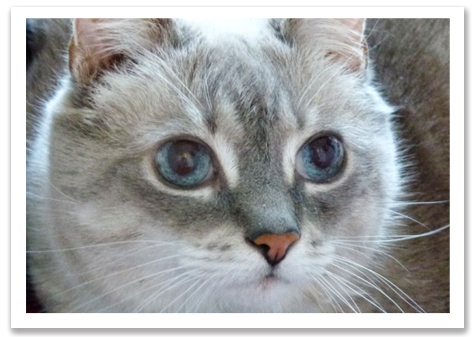 If you'd like to make a donation to help with Chloe's long-term care, you can use this LINK to their PayPal account. Thank you! 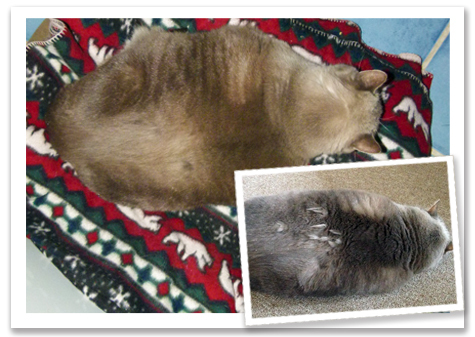 It's been almost two weeks since the grossly overweight and possibly abused kitty, Chloe, was removed from her home and placed under the care of Animals in Distress. For now, Chloe is staying with my friend, Katherine, who oversees intake of all the cats in the AID program and is a very savvy foster mom. Chloe has had a peaceful few weeks and after only one incident I reported initially, Chloe has not lashed out at Katherine. 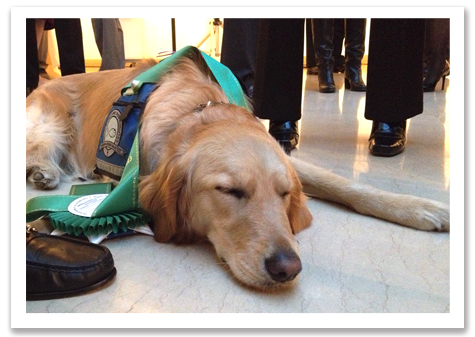 In fact, Chloe is showing signs of relaxing and learning to trust again. ©2013 Katherine Reid. Hopefully this is one of the last photo you'll see of Chloe's back mats! Katherine is starting to remove them. The first few days were the toughest. Chloe would not move, urinated and defecated on herself and barely ate. Katherine tried to clean her off, but was met with so much resistance that we all decided it was best to leave her alone. Katherine focused on offering Chloe a variety of grain-free dry food as her first attempt to get Chloe moving in the right direction. 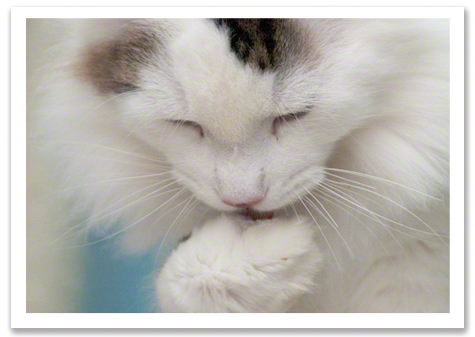 Chloe took to one of the brands and began to eat. Katherine also offered Chloe some plain chicken baby food from a spoon, which encouraged Chloe to both regard Katherine in a positive way and to help Chloe want to interact, instead of withdraw. Katherine had to move slowly and not do too much. It was easy to upset Chloe, so she did less, instead of overload her. 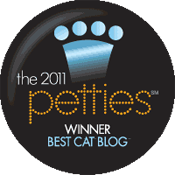 With the guidance of our friend Wendy Christensen, cat behaviorist and author, she kept the pace to baby steps only. ©2013 Katherine Reid. Is that a smile I see? 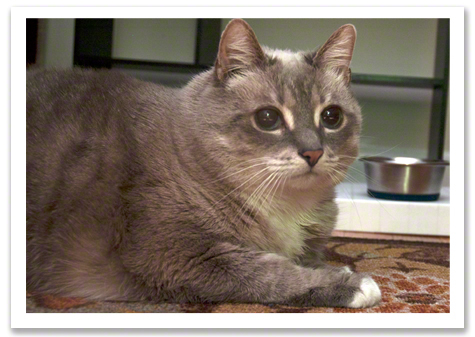 Chloe began using her litter pan and eating more than a mouthful of food. 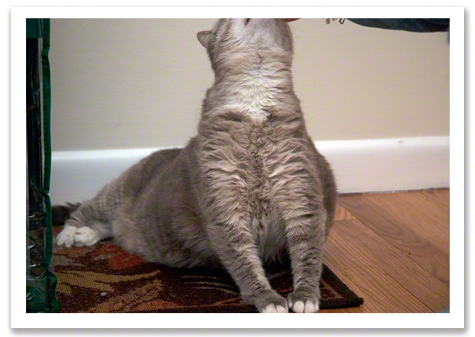 With such an obese cat, we have to be careful NOT to restrict her food intake as much as IMPROVE her food, for now. 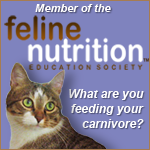 Once she is stable, she will no longer be free-fed and will begin the process of eating grain-free canned food, in monitored amounts, until she can lose some weight. Chloe also may have bad teeth and an ear infection-both issues will be dealt with as soon as we feel Chloe can be handled without it putting her into a panic. We're hoping that at least the ear issues may resolve, to some degree, with better food. 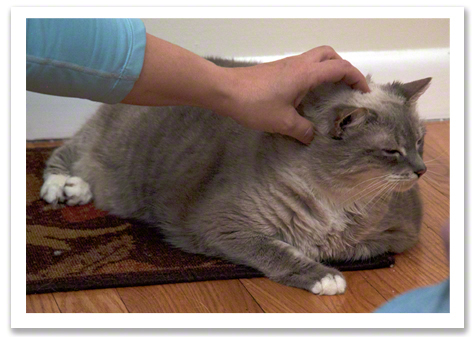 Her body may be reacting to the grain in the food by making her ears get a build up of material. It's unlikely she has ear mites, but she WILL get the treatment as soon as it's safe to do so. ©2013 Katherine Reid. Chloe's sweetness may be starting to emerge-and what a cute face she has! 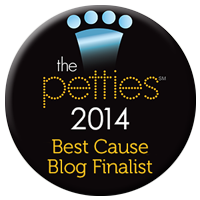 This morning I got a note from Katherine that she had another small breakthrough. Last night she was able to brush Chloe's face, which she liked, and while she was brushing Chloe, Katherine managed to pick out a few of the mats on the cat's back (which she pulled out easily without causing any irritation to Chloe). As you can see in the photos, Chloe looks like she's almost smiling and for that, we are all very pleased and hopeful that Chloe's story will continue to be one filled with promise. I know we're all rooting for this kitty to make it through this difficult time. Animals in Distress is a 501 (c)3 non-profit organization. If you'd like to make a donation to help with Chloe's long-term care, you can use this LINK to their PayPal account. Thank you! ©2013 Katherine Reid. Lucy, safe in her new foster home. 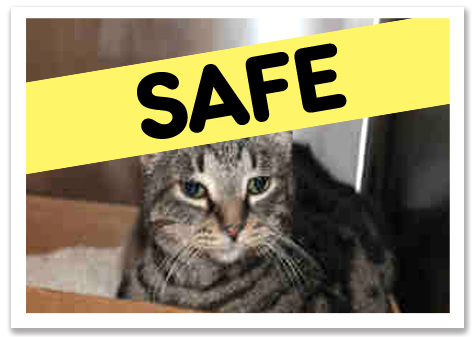 UPDATE: Shortly after Chloe was returned from the home, the former guardian called saying that Lucy HAD to go, too. Lucy has been placed with AID and is doing well. I've met this cat and she's VERY friendly and gets on well with other cats, too. 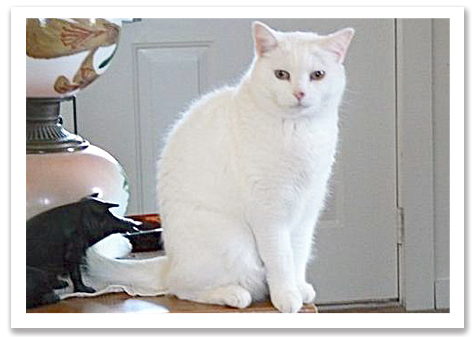 If you live in CONNECTICUT and would like to know more about Lucy, please visit her PETFINDER PAGE!. Who knew the need to vent my frustrations, living with an ever-changing number of cats, would lead to all of this? It began with this post. ©2006 Robin A.F. Olson. 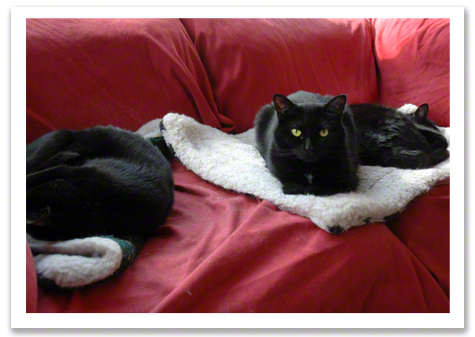 Here's my cat, Cricket (center) flanked by his brother, Boo-Boo and sister, Sophie. Back then, Boo-Boo was one of the inspirations to starting my blog (because he was so annoying! 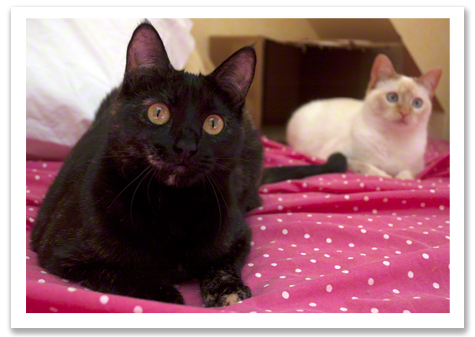 )Boo and Sophie were later adopted together. For those of you interested in the origins of Covered in Cat Hair, you should know that this blog was meant to be a book project entitled: Covered in Cat Hair: the Mostly True Stories of a Life Spent with Cats. James Frey had just been busted for lying about his tome: A Million Little Pieces and I figured I had to add the “mostly true” part just in case I goofed up on some facts. My brilliant idea was that since I stink at cold-calling Editors and Publishers and writing pitches, that simply the fact I was writing a blog would be enough fodder to lure them into discovering my fresh voice, and shortly thereafter offering me a lucrative book deal (which, to date, I'm still waiting for). ©2006 Robin A.F. Olson. 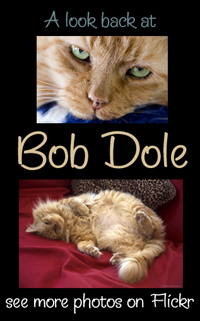 A few months after Covered in Cat Hair began, I inherited my Mother's cat, Bob Dole, after she passed away. My Mother never read my blog or any of my work, saying she would wait for it to be published, first. In the meantime, I began writing my book, not really focusing too much on blog-length posts. I wrote about 90,000 words (yes, that's a lot, but not quite enough for a book). Each chapter is a short story. Some of the stories are poignant and some flights of foolish fancy. I was determined to finish my book, but I realized no one would want to read such long posts online so I had to change course on my blog. I was fostering for a rescue group and thought I'd write about the cats in my care. There were many stories to share, but my “boss,” the Director of the group, did NOT like me writing about her or anything else we were up to. I also couldn't post photos with my stories, which frustrated me endlessly. I grew up with a camera in my hand and telling stories and sharing photos is natural to me. ©2009 Robin A.F. Olson. 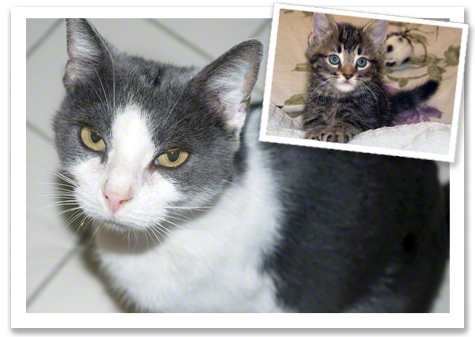 Blueberry and her brother, Blackberry were rescued from South Carolina. I kept writing. I used aliases. I waited for technology to get to the point where I could share photos and I began to write posts to help other people with their cats, as well as to continue telling stories about my foster cats. ©2008 Robin A.F. Olson. Two of the Pi Day babies, Happy and Jelly Belly. 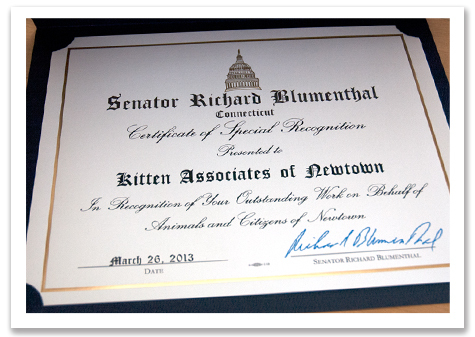 In 2009, I came face to face with the cruel truth of what happens to cats in the southern part of the USA. It was something I'd already heard about, but I didn't know just how horrific it was. I'd been sheltered, pardon the pun, from knowing about abuse, over-population and mass euthanasias of cats, because I felt I was “too sensitive” to handle the truth. I did my fostering and kept out of the rescue part. Once that curtain was parted, my life changed forever. ©2010 Robin A.F. Olson & A. Merritt. The Halloween Express-four kittens in a kill shelter in Georgia didn't have a chance. 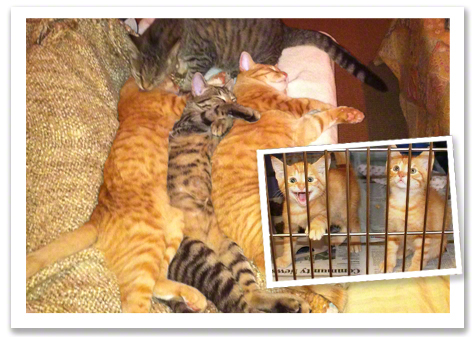 We rescued them, did quarantine, and placed them in a month-ALL TOGETHER with ONE FAMILY! You can see how well they're doing, laying crammed next to their Mom's lap in this recent photo. 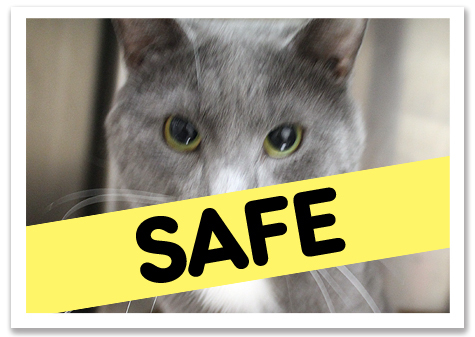 When I found out that about 95-98% of cats don't make it out of southern (and other) municipal shelters, I thought I would die from the news. 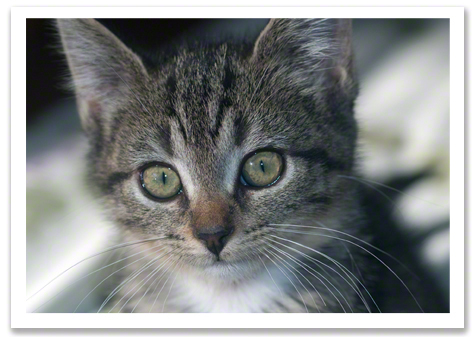 I imagined all those cats, many of them newborns and kittens, dead in a pile waiting to be…who knows…taken to the dump? Incinerated? 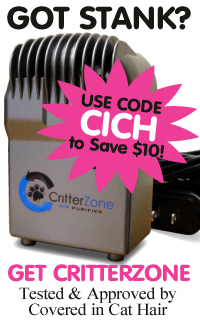 Used in pet food? (I'd heard that was true, but could never prove it). ©2006 Robin A.F. Olson. The now infamous, Huggy Mama, the first cat (and her two offspring, one pictured here) I rescued out of a kill shelter in 2009. She and her two boys were adopted TOGETHER. I could keep turning away or I could look, stone-faced and soberly at this HELL and I could raise my hand and offer to do something about it-even if it only helped a small handful of cats. I met with a great deal of opposition. 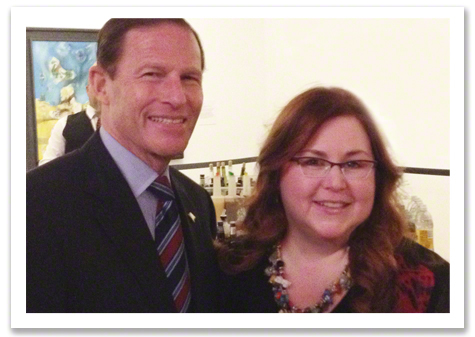 It was difficult work, but I had an excellent team in Georgia offering to help me led by Maria and Bobby. It pushed all my boundaries. 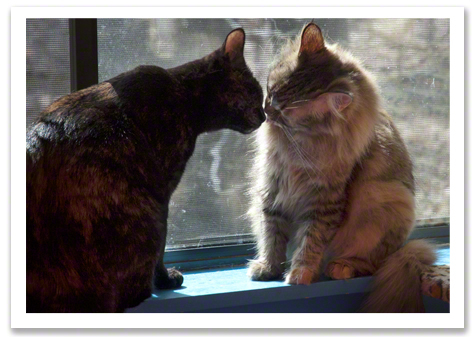 I was rescuing cats I never had a chance to meet before agreeing to rescue them. 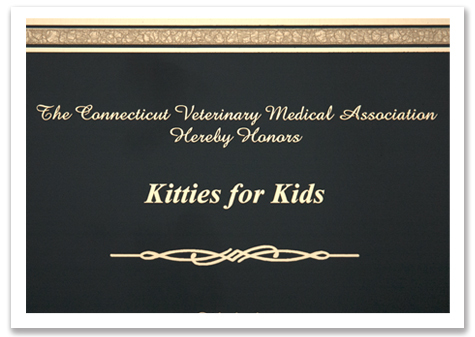 I had to hope they would be nice, adoptable cats who didn't have serious illness. I raised money for these rescues and was overwhelmed by how many people cared, to the point of being willing to send me $5 when that money was the WORLD to them. ©2009 Robin A.F. Olson. 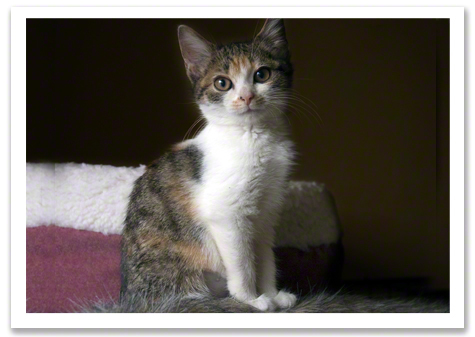 1 in 7 million are the odds that this little calico named Gingerbread would be a male. He surprised us all. I left the rescue I was with under great duress and with a great deal of anger for how I was treated. 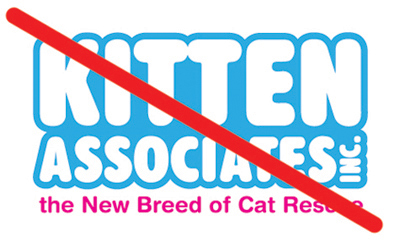 I opened Kitten Associates, scared out of my mind that I was taking on more than I could handle. 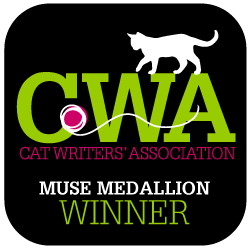 I knew enough to get myself in trouble-and I did just that, but I kept writing, buoyed by the supportive emails and calls I got from so many of you. If nothing else, I figured I could be a warning to others about what not to do with your life. ©2006 Robin A.F. Olson. 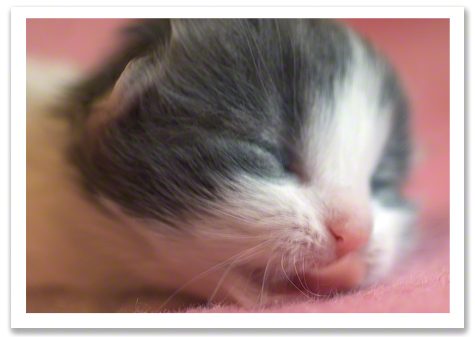 Poppy, about a week old. Where Covered in Cat Hair has taken me, I could have never imagined. 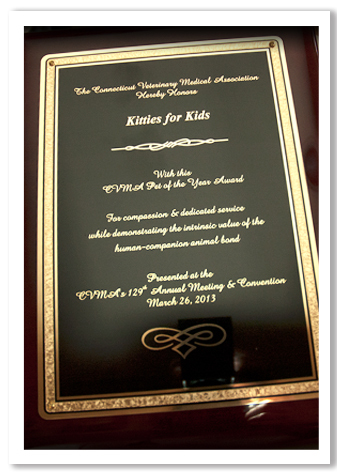 I've been honored with many awards and accolades. 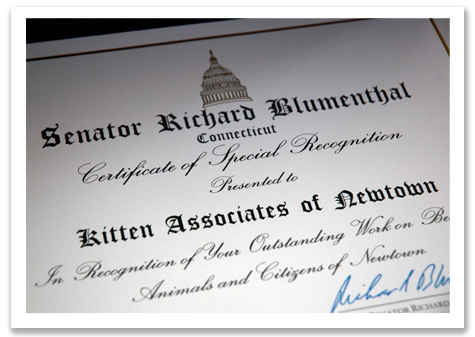 I've met wonderful people who share my passion to save cats, enrich their lives, to help their guardians cope with behavior problems and to feed cats a species appropriate diet. I cherish my cat-lady-babes, every one of them. ©2007 Robin A.F. Olson. Will & Grace. The biggest surprise to me, and the most humbling, is that no matter what kind of trouble I get myself into, what heartbreak I share, what triumphs I achieve, you are right there with me, cheering me on, offering your shoulder when times get tough and sharing your insight and stories from your life in return. ©2009 Robin A.F. Olson. CallaLilly & daughter, Sunny. I am so in love with all of you and so very grateful for your support these past seven years. 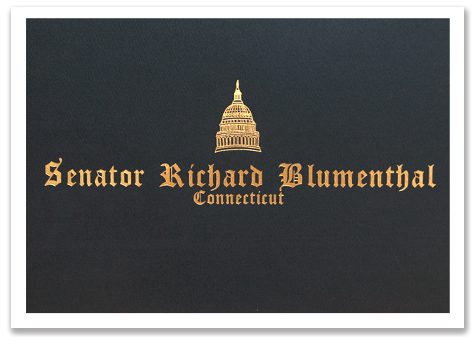 Thank you for being part of my journey—it's one I hope will continue for a long time to come. Our Lovely Ladies Find Their Forever Home-At Last! The main foster room is quiet now. I don't hear the thudding, stomping, or occasional crashing sounds from above my office in the room where Coco, Latte, Willow, Barney and Fred lived. Three young cats still live there, waiting for their forever homes, but as of this afternoon, two have moved on. ©2013 Robin A.F. Olson. The perpetually lovely, Coco. I'm sad. I'm always sad to see them go. They were here far too long. 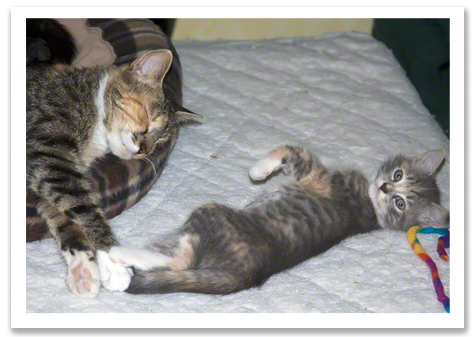 These cats were in our program for almost a year-which astonishes me since we had them when they were kittens, but at that time, when they were most adoptable, many of them had health issues and we had to wait to place them. 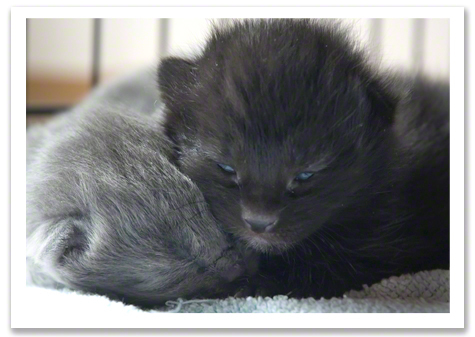 I was also up to my ears here, having taken on a litter of all black (save for one) kittens who were taking far too long to adopt out, as well. It meant this group from Georgia had to wait even longer to arrive and once they did it seemed like either no one wanted them or one adopter after another fell through. ©2013 Robin A.F. Olson. Ready to pounce. I must have gotten 50 inquiries and many of the applications on Coco. 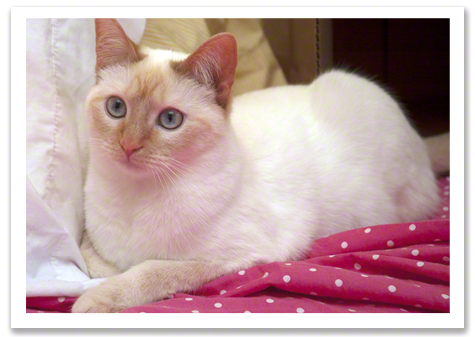 Of course everyone would want her being a Flame Point Siamese mix. 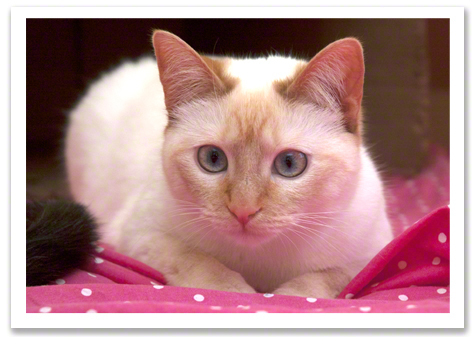 Who wouldn't want a cat with peach and china blue eyes and delicate orange points (a creamy coat with darker facial masks, ears, tails, paws, nose leather and paw pads. These darker areas are known as their points.). Of the many applicants there were a very few good options. Some just lived too far away, in states with tough animal importation laws, and there were too many other things going on, too. I have no volunteers to help process applications and the task can be daunting for me. 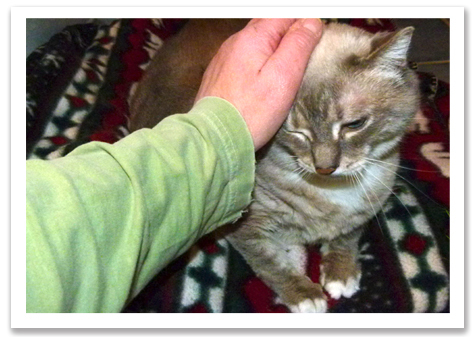 I did one home visit, thinking I had Coco's home, but with all due respect, it was too cluttered and though the people were so very nice and lovely, I just couldn't place Coco there. Knowing she tends to be a bit “Princessy” I imagined her hiding under a bed for the rest of her life. I still feel badly about that, but I had to move on for her sake. What could I do? I moved on. Coco was 7 or 8 months old by now. Lucky for her she still had her looks even if she wasn't a sweet little kitten. Sifting through more and more applications I finally hit a good one from a very nice lady and her husband. They live north of here and didn't currently have any cats or pets. I was worried that Coco would be sad, but I also was feeling like I had to get her a home and she would be treated so well that perhaps she would be happy being on her own? Her new mom didn't work full time so Coco wouldn't be alone a lot. I did the home visit and it went very well so we made plans for the couple to meet Coco in a few days. “Oh no, not this again.” I thought. I liked this family so I gave them a break and said to let me know when they got back from their trip, worrying that I would never hear from them again. Though there was very sad news for the family, they wanted to move forward with the adoption and let me know when they returned, as promised. But now Coco was sick! She had a slight fever and wasn't eating. She wasn't running after her toys so I took her to the Vet. They gave her SubQ fluids and sent her home. Hopefully whatever it was would pass. Of course-perfect timing. ©2013 Robin A.F. Olson. The goofy twosome. I almost lost the adoption again when I had to tell the family Coco was sick. There was some confusion, but in the end it worked out. They waited a few days and came to visit Coco when she was nearly well enough to be adopted. It had taken almost a month to get to this point. I was very hopeful this was going to be the one that would stick. ©2013 Robin A.F. Olson. Those heart-stopping eyes. 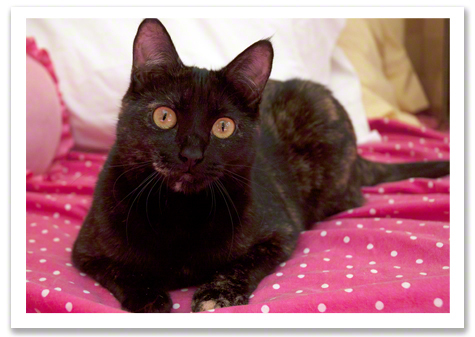 During the visit, Faith, Coco's new mom, talked to me about adopting Coco as a sole cat. I was honest, but not pushy. I preferred Coco go with one of the others, but I would never try to manipulate someone to do that. I explained the benefit of having two cats who are already friends-watching them play, groom each other, sleep together. She'd know they'd keep each other company when no one else was home. Since the house was large and there were no other pets, why not, if the family could afford a second cat. Right away Faith started looking around the room. 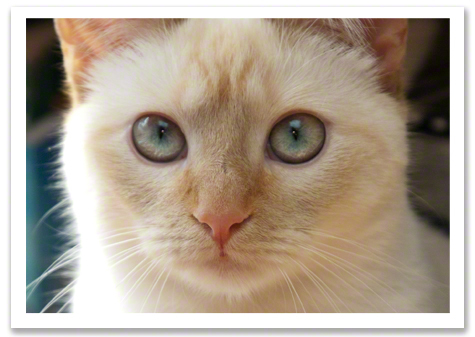 Her eyes fell on Latte who was rolling around on the floor getting litter dust on her fur. “I like that one. What do you think of her going with Coco?” Faith asked. ©2013 Robin A.F. Olson. 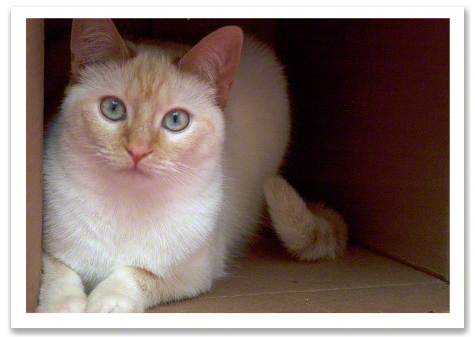 I nicknamed Latte, La-La and she often came to me when I called her by that name. I tried not to jump up and down. 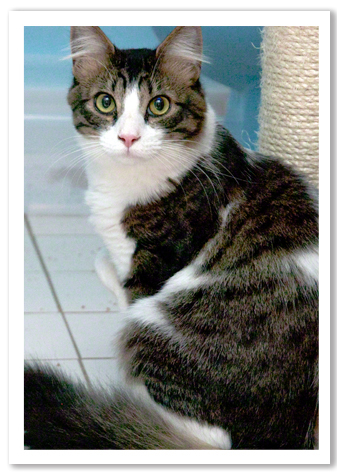 Here was the cat I had NO applications for-NONE-possibly going to be adopted with the cat who had the MOST applications of any cat we've ever had! There was some discussion back and forth about maybe Barney being a better choice. The husband wasn't a big fan of Latte's but I had a feeling she would win him over later. In truth, these were Faith's cats. He just had to nod and smile, which he did with resigned elegance, I must say. ©2013 Robin A.F. Olson. 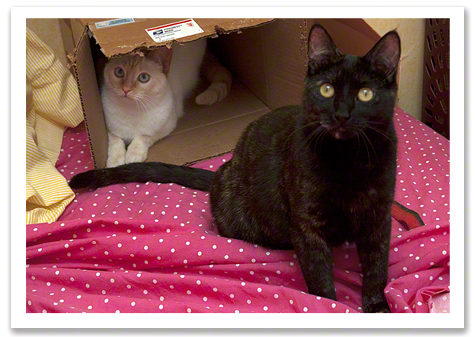 Latte and Barney ready to pounce. I encouraged them leave without taking ANY of the cats. I wanted them to think about it over night. I promised I'd bring the cats to them, whatever they decided. This is a big commitment to take on and it should not be rushed. The next morning I got an email from them. I was afraid to read it, but once I did a big smile spread across my face. They wanted both girls and could I please come soon? They didn't want to wait any longer. ©2013 Robin A.F. Olson. Raised together as sisters and will now be adopted together! This afternoon I packed the girls up into cat carriers and also packed up some food, toys and two cat beds that were made for us by Mrs. Medaugh's Third Grade Class at St. Rose School in New Lexington, Ohio. I packed Latte's favorite Kong toy and I added a catnip banana to the mix since we had a few that were donated to us. The girls were silent the entire journey. I knew they'd be scared, but I knew they'd work past it. My job was to get them settled and say my farewells though I had a very heavy heart. ©2013 Robin A.F. Olson. Latte and Willow had become very close with Latte turning to Willow as she would her own mother. I saw them grooming each other from time to time and I hoped that Latte would find the same affection from Coco one day. Faith cheerfully met me at the door. She carried Coco into their new room while I took Latte. I suggested that we start the girls off in just one room, so they didn't run off and hide somewhere, never to be seen again. The room Faith chose is a lovely corner space on the main floor. There are french doors on one side, with windows all around. It's brightly lit, clean and warm. 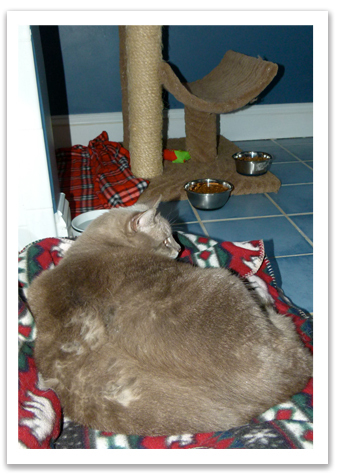 Faith set out a big cat bed-enoguh room for two, some cat scratchers, a tiny scratching post and some toys. We sat on the floor together as the girls explored, but mostly hid, in their new home. ©2013 Robin A.F. Olson. The part of the story we're never sure we're going to reach when we first do a rescue. 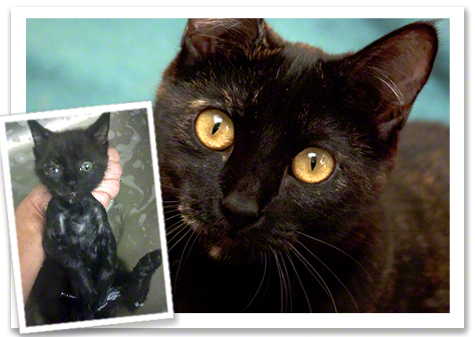 Tiny Coco was living outdoors in terrible conditions when we rescued her. You can read some of her backstory HERE. I probably told Faith too many little things to make sure she did, so the introduction phase went well…things like not to go after the cats but let them come to her..not to move the litter pans too soon into the basement and to not move the girls out of the room until she saw them walking with their tails held high and were confident in their new space. It would take time for them to adjust, but going slowly would pay off later. I'd already kissed each cat goodbye before I put them into their carriers and left for their new home. I only had a last glimpse of Latte's nose and tail pocking out from under a dresser and no sign of Coco at all. I knew they were under the dresser together, but I was sorry our final moments weren't a bit sweeter. ©2013 Robin A.F. Olson. Latte and her brother, Tater Tot were terribly ill-especially Tater. Latte blossomed into a big, strong beauty. She and Coco were born on the same property to different mothers. It's possible they may share the same father. Some of her backstory is HERE. I have to let go, just like I always do, so I turned and said goodbye and quietly closed the door behind me. It's time to move on. I have more lives to save and Kitten Season is here. There's no time to waste. I need to make room for more…for more stories and for more sweet kittens to fall in love with, who I will gladly let break my heart again and again. It's an exercise in my dedication to these cats. To Coco, you are a true beauty and I'm so happy for you. 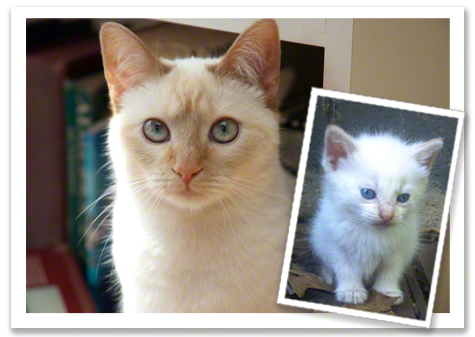 To Latte, watching you blossom has been an honor; from terrified to a little gem of a warrior. You have a sparkling soul and I adore you. I hope you and Coco will know a lifetime of love. I've done my best to make sure you have the best chance at finding it. The rest is up to you. Read more about Our Lovely Ladies Find Their Forever Home-At Last! I'm in deep doo-doo. It's not even that I have SEVENTEEN CATS in my house right now, it's that I've met foster kitty, George! I decided it was time to move foster kitties George, Bongo and Bunny-Boo Boo from Maria's house in Georgia to my house in Connecticut so we could get going on finding the cats forever homes. We rescued them FIVE MONTHS AGO and in that time I had hoped my other foster cats would have been adopted. 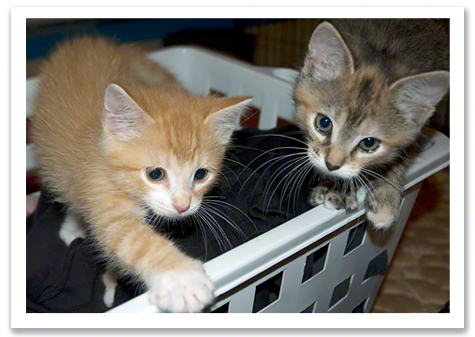 With Kitten Season upon us, I have to crank things up a notch and hope we adopt out at least some of these foster cats before there are loads of kittens competing for adopters. ©2013 Robin A.F. Olson. Meet George. Most of the time I use a professional transport service to move our cats north. 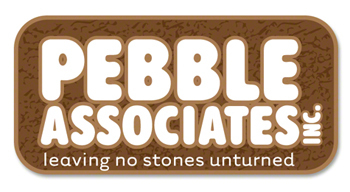 I really like PETS, LLC because they have been very trustworthy and prompt and their rates are reasonable. The only bad thing is the transports are usually filled with dogs. None of us love that the cats are with dogs, but the cat's discomfort only lasts for about a day's time (and they ARE in separate crates and some times even a separate walled off space from the dogs). The cats adjust and after they arrive here, within a very short amount of time, they are playing, eating and enjoying their new home. ©2013 Robin A.F. Olson. How many gorgeous cats are in this photo? Answer: All of them! But…Maria didn't want to put these cats on the transport. I understood her reservations and certainly didn't blame her one bit. In five months of fostering, the close bond Maria had with the cats made it even harder for her to let them go on a truck full of dogs. Our only other option was to ask our friends Izzy and Mark if they were going on any road trips to Florida any time soon. ©2013 Robin A.F. Olson. Keep that pretty face clean, George. Izzy and Mark LOVE cats. If you've read my blog before, you know they will do anything to help any animal and their home in Pennsylvania reflects their passion. They've shared photos of their bed-it's covered with cats. I've seen a photo of Izzy on her sofa, working, flanked by the couple's two dogs, with cats at her feet. When Izzy and Mark go on a vacation, the always offer to bring rescue cats back north with them and many rescues are very grateful for their generosity. ©2013 Robin A.F. Olson. Helloooooo Bongo! 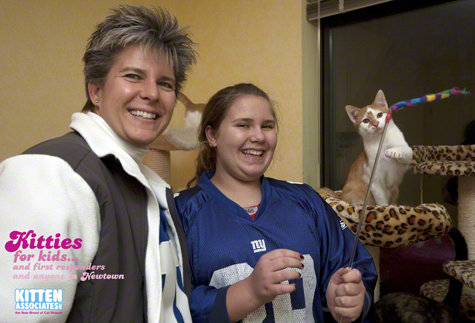 Though they had no plans to travel, Izzy and Mark offered to drive down to Georgia, then drive back to PA and meet us with the cats! Yes, that's something crazy people do (lucky for us)! Before I knew it, in the space of a day, a plan was hatched. Izzy and Mark would leave Wednesday morning and drive to just north of Maria's in Georgia. They would get a good night's sleep, then pick the cats up very early on Thursday. By Thursday night (last night) they'd get the cats to the Perkins near the state line of NY and PA where we would meet them and take the cats the rest of the way home. ©2013 Robin A.F. Olson. Bongo is the spitting image of our former foster kitty, Charly! Tuesday night, Coco fell ill. She had a fever and wasn't eating. I took her to see Dr. Mary the next morning. 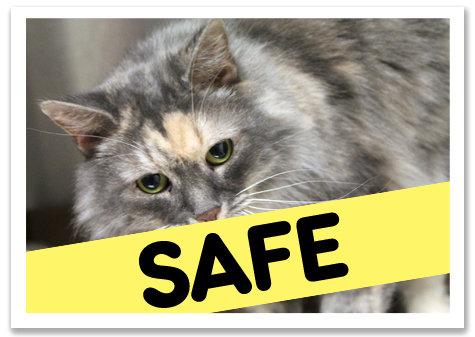 They ran some blood tests and re-ran her snap test to see if she had Feline Leukemia or FIV. Great. Now what do I do? Do I tell Izzy and Mark to turn around and go home? What if Coco had something terrible? What if she was contagious? Sure, she wouldn't be in the same room as our new arrivals, but it's pretty much impossible for me to prevent transmitting disease as I go from one foster room to the next-even if I wash my hands and change clothes. ©2013 Robin A.F. Olson. Portrait of cuteness. 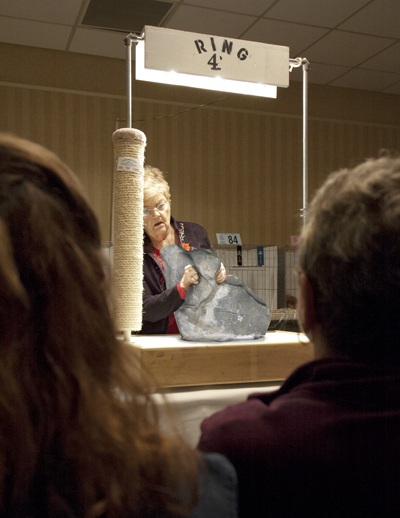 If I cancel the trip, it will be TWO MORE weeks before the PETS transport runs and then we're in mid-March. I just had to hope that Coco would not be sick for long while visions of not only her, but the other four fosters getting sick...then the disease spreading throughout the house to ALL the cats swirled through my mind. ©2013 Robin A.F. Olson. 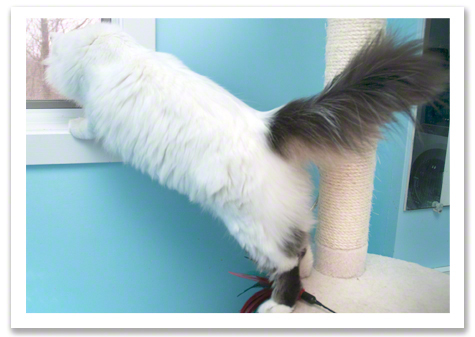 LOOK AT THAT TAIL! I spoke with Maria and we realized we needed to just do this transport. It would be better for the cats and after having nine deathly ill foster cats here two years ago, I figured with any luck, I would be able to manage what was yet to come. Ha ha ha. I think it's funny, too…funny or foolish. ©2013 Robin A.F. Olson. 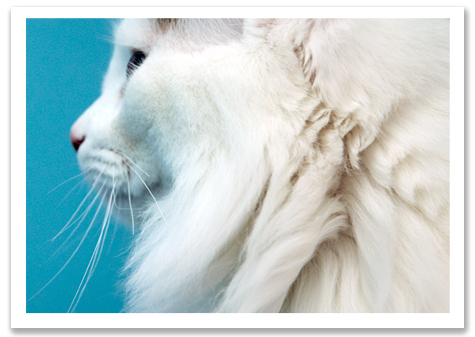 White Lion or domestic house cat? I spoke with Dr. Mary the next morning. Coco's blood work indicated her white blood count was very high, which was her body's response to a virus or bacterial issue. She wanted to put her on antibiotics. Normally, I would just do that, but now I'm much more conservative about using antibiotics and more prone to allow the body to defend itself. 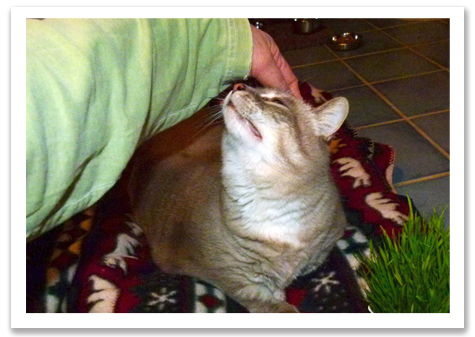 Coco had begun to eat and perk back up after we'd given her subcutaneous fluids the day before. The blood test results were from the day before, too. Just because her white blood count was high then, did not mean it was STILL elevated now. I decided to let Coco heal on her own and, of course, if she showed ANY signs of feeling poorly I would get her on the medication right away. She was still negative for Feline Leukemia and FIV, too. ©2013 Robin A.F. Olson. Goofhead. Now I just had to get ready for the new arrivals so I got to work cleaning the foster room. After that I made myself a sandwich for lunch. I'm including this boring detail because not long after that I got SICK. Needless to say, driving 100 miles each way to pick up three cats at 9:00 PM in the middle of the boonies of mid-state New York is NOT something you want to do with a stomach ache and little, if any, access to a bathroom. ©2013 Robin A.F. Olson. Poor Bunny. She'll feel better soon. Izzy and Mark were running ahead of schedule AND the weather was about to take a turn from just cold to rain, sleet and snow mixed together. There was no way to back out of the pickup trip. I decided to take a nap and see if that would help any. Sam took a nap, too, since he was really tired and we were both going to do the run together (and hopefully not both GET the RUNS together since I made HIM a sandwich, too). When I got up I felt just as awful as before, but now I also felt really groggy. I woke Sam up and had a difficult conversation with him. He had to do the run on his own. I just couldn't do it. I'd print out the directions, get him everyone's phone number and stay up in case he needed me for anything while on the road. I felt so terrible asking him to go alone, but he took it with a grain of salt while I stewed in my guilt. ©2013 Robin A.F. Olson. Oh so delicate. As it turns out, the trip was a quick one. Izzy and Mark were very tired and just wanted to get the cats to Sam and head home. They had been on the road for nearly fourteen hours by that point and still had three and a half more to go. Sam texted me saying he was turning right back around and would be home soon. By 11pm Sam called saying he was down the street. I thought; “Here goes nothing.” Then started praying this wasn't the stupidest idea I've ever had. ©2013 Robin A.F. Olson. Bongo wants to start the day with a belly rub. We got the cats into the foster room. I had my first look at each one. George was calm, cool and collected. He let me hold him right away. I took one look at him and knew I was in trouble, suddenly realizing that to avoid “foster fail” I should rescue cats I'm NOT going to LIKE, yet here in my arms was my dear cat, Spencer's little twin brother. 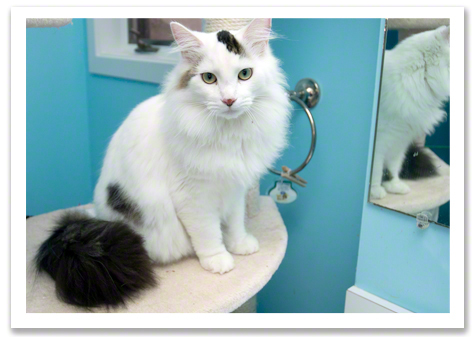 George has the same mostly white Norwegian Forest Cat body, the crazy spots of tabby, the biggest, fluffiest tail I have EVER SEEN, a plush coat and ruff AND he's a NICE CAT to boot. ©2013 Robin A.F. Olson. The CRAZIEST tail I have ever seen! Bongo hid behind the litter pan. Poor Bunny didn't even come out of the cat carrier. I knew to keep the room dark and quiet. I put out some food and left them to rest from their long trip. I set up an electric blanket for them in case they wanted to snuggle and I whispered goodnight to them and headed to bed…but first another trip to the bathroom. Ugh. ©2013 Robin A.F. Olson. Oh Bunny, it's going to be OKAY! This morning George and Bongo came over to say hello. I saw Bongo's nerve-damaged leg curled tightly against his body as he walked towards me. He walks with a wobble, but he doesn't let that stop him. He came over and laid down on the floor next to me. He rolled over and showed me his belly. He got up and laid against my lap and purred deeply. Oh crap, another cat to fall in love with! Bunny is still scared, but I know she'll come around. It hasn't even been 24-hours yet and we all need time to get used to all the changes. ©2013 Robin A.F. Olson. Doomed. I'm doomed! I need to MOVE fast and get these cats adopted. I'm going to have to walk a fine line between being friendly and emotionally distant or I'm going to have nine cats again…or ten…oh crap! I'm doomed.